The WHRI is a real & virtual organization designed to facilitate women's health research while providing a community for women's health researchers. In the segment Dr. Proden-Bhalla discusses the importance of BC Women’s Hospital’s Access Clinic and the specialized sexual health care they provide for women with disabilities and transgender patients. Learn more about the ACCESS clinic here. Dr. Wee-Shian Chan was featured in the news! Dr. Chan commented on abnormal symptoms women should bring to the attention of their healthcare provider to help protect heart health throughout pregnancy. Click here for the full story from JumpRadio.ca. 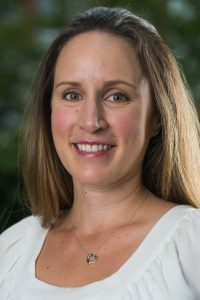 Dr. Hanley received the grant for the project “The effectiveness and cost-effectiveness of opportunistic salpingectomy for ovarian cancer prevention”. In a few sentences, what is your research about? Evidence strongly points to the fallopian tubes as the tissue of origin for the most common and lethal form of ovarian cancer (representing 70% of all cancers and 90% of all deaths from ovarian cancer). We are determining whether removal of fallopian tubes at the time of hysterectomy or in lieu of tubal ligation (referred to as opportunistic salpingectomy) is an effective ovarian cancer prevention strategy. Given our effectiveness findings, we will also determine whether opportunistic salpingectomy is a cost effective cancer prevention strategy. What impact do you hope your research will have? We expect these results will accelerate what has already been a global change in practice towards opportunistic salpingectomy. If opportunistic salpingectomy is effective in preventing ovarian cancer, we will shift the focus of ovarian cancer to prevention and dramatically reduce the incidence of this deadly disease throughout the world. Are you using any innovative approaches in your research? We are taking advantage of both BC’s and Ontario’s rich data resources to assemble a population-based cohort including all women who underwent opportunistic salpingectomy and all women who underwent comparator surgeries (hysterectomy alone and tubal ligation). We will follow them until the end of 2019 to determine rates of ovarian cancer. 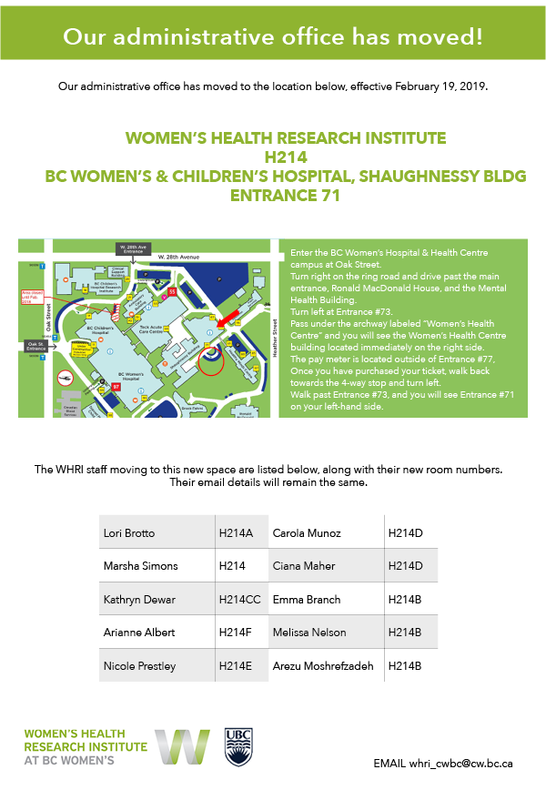 WHRI’s Administrative Office has moved! Our administrative office has moved, effective February 19, 2019. Click here to download directions to our new office. Dr. Côté received the award for her project “The BCC3 cohort: Cellular aging in women living with HIV”. My research focuses on the health of women living with HIV and their children. We are studying how the virus and the medications used to treat the infection affect cellular aging processes and their health over time. We are also asking how exposure to HIV and medications during pregnancy may affect mother and child in the short and long term. By understanding and teasing apart the effects of chronic viral infection(s), of various HIV medications, and other sources of stress on cellular aging, we hope to gain important knowledge on which medication may be safer for women, both before and during pregnancy, as well as later in life. We also want to identify the modifiable factors we should work on to promote healthy aging. We seek to have a holistic approach to research. We consider not only the clinical and demographic factors that may affect markers of cellular aging but this recent grant, through a collaboration between two ongoing cohorts in BC (CARMA and CHIWOS), will also consider how other common chronic or latent viral infections (herpes virus, cytomegalovirus, etc.) and how psycho-social factors (mental health, stigma, etc.) may also affect cellular aging and comorbid diseases. 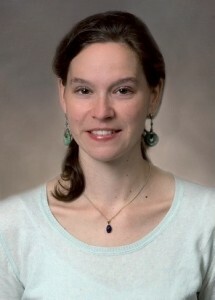 Dr. Renner received the grant for “The Canadian Surgical and Medical Abortion Provider Survey (CAPS)” project. Our research is about exploring abortion provider characteristics and clinical practice in regards to first and second trimester medical and surgical abortion. This is a national survey, and we’re hoping to capture potential changes to the results of a similar survey conducted in 2012, since Mifepristone was introduced in Canada in 2015. This work will provide crucial evidence to inform health policy, system and service leaders and regulators charged with providing equitable, free-of-harassment, and high-quality nation-wide access to abortion services. These high impact decisions may result in: expansion of access to abortion care, in particular to women residing in rural and remote areas, credentialing of multidisciplinary providers, organization of services, update of guidelines, and creation of educational opportunities. We aim to expand our sample framework compared to the previous 2012 survey in order to capture changes in abortion care workforce since the implementation of Mifepristone in 2015. That will probably be the biggest challenge – to have a very broad sampling framework to capture abortion providers that work in bigger clinics, solo providers, rural or urban providers – people who might not necessarily identify as an ‘abortion provider’, but provide services as part of their other clinical work. In order to conduct the best possible survey with the most optimal sample framework we have built a large multidisciplinary research team including family planning experts from across the country. Our repeatedly CIHR funded Canadian family planning network (Contraception & Abortion Research Team, CART-GRAC) engages with the national health professional organizations for nurses (CNA), gynecologists (SOGC), and family physicians (CFPC), in addition to government leaders. Additionally, we paired more junior researchers, like me, with senior researchers, like Dr. Wendy Norman. This is a fantastic career development opportunity for me. Dr. Regina Renner is a family planning specialist and Clinical Associate Professor in the UBC Department of Medicine, Division of Obstetrics and Gynecology. She has been a CART member since 2011 and is also the Co-director of the Family Planning Fellowship at UBC. Dr. Helene Cote was featured in the news! The Vancouver Sun featured Dr. Cote in an article about her study on birth rates among young teen and adult mothers who are HIV-positive. Dr. Jerilynn Prior was featured in the news! Dr. Prior was featured on the CBC Radio show “White Coat, Black Art” to discuss her recent publication about the link between combined hormonal contraception and loss of bone mineral density. She was also featured in an article on CBC’s White Coat, Black Art page, which can be found here. February 11th is International Day for Women and Girls in Science! 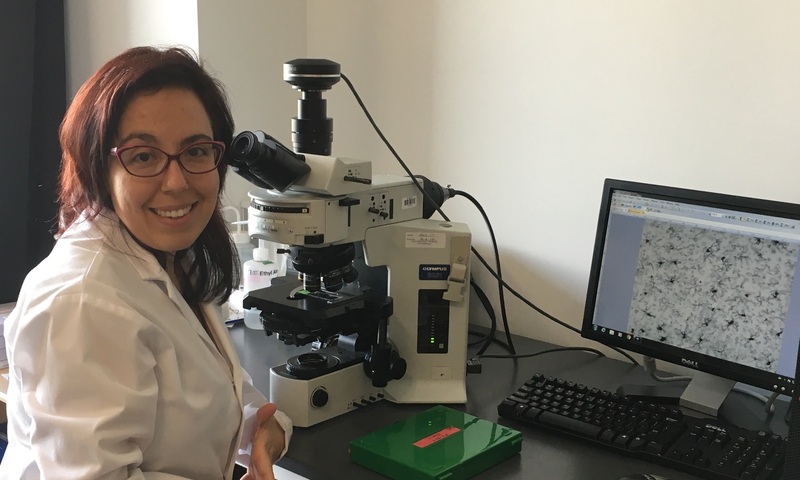 In honour of this day we’re shining the spotlight on Paula Duarte-Guterman, Ph.D., a Postdoctoral Research Fellow at the Djavad Mowafaghian Centre for Brain Health. Q: What is your area of research? A: Pregnancy and motherhood can have long-term effects on women’s physiology, health, and aging. I am interested in understanding how past motherhood experience affects the brain, cognitive decline, and risk of developing Alzheimer’s disease later on in life. Q: What inspired you to pursue a degree/career in science? A: I love asking questions (why?, how?) and learning new things every day. Q: What advice would you give to girls and young women who want to pursue education/work in STEM? A: Surround yourself of a good support system (family, friends and colleagues) and look for mentors that will support your career. In the end enjoy it and have fun. I am fortunate that my job is also my hobby! Congratulations to Dr. Melanie Murray and team who have been awarded a UBC Partnership Recognition Fund grant entitled “Research mentorship and training for Indigenous PLWH” in collaboration with the Canadian Aboriginal AIDS Network (CAAN)! The grant was awarded to Dr. Murray, Valerie Nicholson, member and previous Chair of CAAN, and Amber Campbell, Master’s student. The team will train two peer-research associates who will then help conduct two CV-building workshops for Indigenous community members interested in research. Your participation helps our researchers and health care providers to develop better care practices through evidence-based decision-making. Donor support of the Foundation helps programs at BC Women's improve, thrive and grow to meet the needs of women and their families with the best possible care. © 2019 Women's Health Research Institute. All rights reserved. | Website design & development by Artropolis Media.